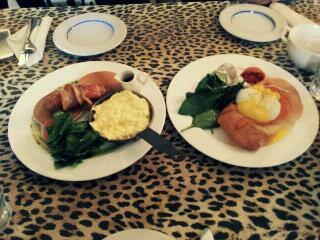 Christmas brunch! This year I spent the Christmas day with some good friends from New Zealand in Korea. Since I was craving some eggs' benedict for some time, we headed to Itaewon, exit 2, to the Flying Pan. 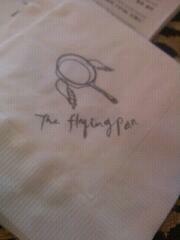 There are three branches of the Flying Pan restaurant - blue, white, and red. We were at the 'blue' branch today. Even though it was a freezing day there were already many people dining inside when we arrived. With a waiting list. Since I didn't want to go anywhere else - I've been wanting to come here for ages! - we waited at another cafe until we got the call to come in. The eggs' benedict wasn't that great, to be honest. The Hollandaise sauce wasn't fantastic. However, the Gangnam style pancake menu was better. The savoury taste of bacon and scrambled egg with the sweetness of pancakes combined. For dessert we had Kahlua tiramisu which was perfectly alcoholic and the portion was large enough to be enjoyed between the three of us without disappointment.